Weather on our trip was not the greatest, so we needed to choose a short hike in case we got caught in a rainstorm. We decided to hike Cypress Grove Trail because we’d read it was picturesque and short. Perfect for our needs, right? Trails are well-marked at Point Lobos State Natural Reserve in California. Most of the trail was flat, though there were some steps and boulders to climb. Nothing was too difficult for the kids, who were 7 and 9 when we did this hike. 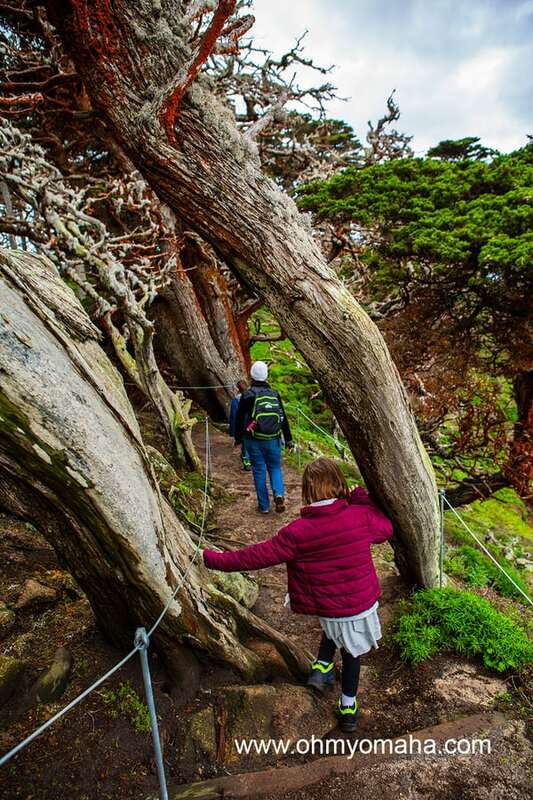 The trail is .8 miles long and takes you through one of the two naturally growing stands of Monterey cypress trees remaining on Earth. If you only have an hour for the park, this is a great trail to take! 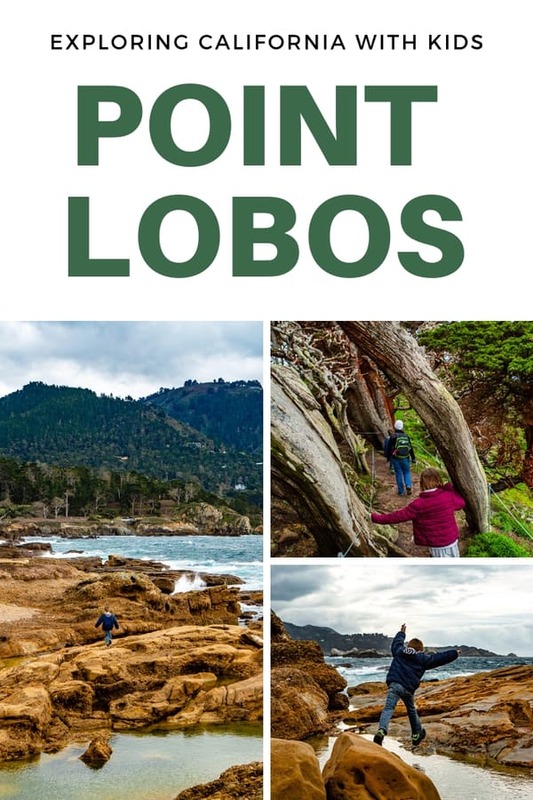 If you have more time, or have other needs, review this page with suggested routes at Point Lobos. We did a little bouldering at Point Lobos State Natural Reserve. This is found along the Cypress Grove Trail. We also hiked a bit of the North Shore Trail on accident after taking a wrong turn. It’s more challenging than Cypress Grove Trail (and longer – it’s 1.4 miles). We turned around before we were too far into it. A view of the gnarled Old Veteran Cypress clinging to a cliff at Point Lobos State Natural Reserve near Carmel-by-the-Sea, Calif. While we were on the North Shore Trail, we took the short Old Veteran Trail to get a good view of the Old Veteran Cypress, a well-known tree in the park. We also got views of sea lions, I think. I wish we’d brought binoculars to get a better visual. Hiking tip: Dogs are not allowed on the trails, nor are bicycles. We nearly drove past the tide pools on our way out of the park, but I’m glad we spotted some families walking on the rocks. They caught our attention, and we wanted to go see what they were looking at. My daughter loves animals and water, so she was in absolute heaven at Point Lobos. It was exhilarating to explore the terrain. There was an element of danger, being near the edge, but it was also a thrill for us. It’s a little nerve-wracking standing even a few feet from the edge. We stayed further back than it looks, I promise! Tip about exploring the tide pools: It’s against the law to collect shells, rocks, wood, plants, or animals at the park. When we visited on the weekend, we encountered volunteers at the Information Station near the parking lot with a display of animal pelts. The kids were able to compare the difference between an otter pelt and a sea lion. 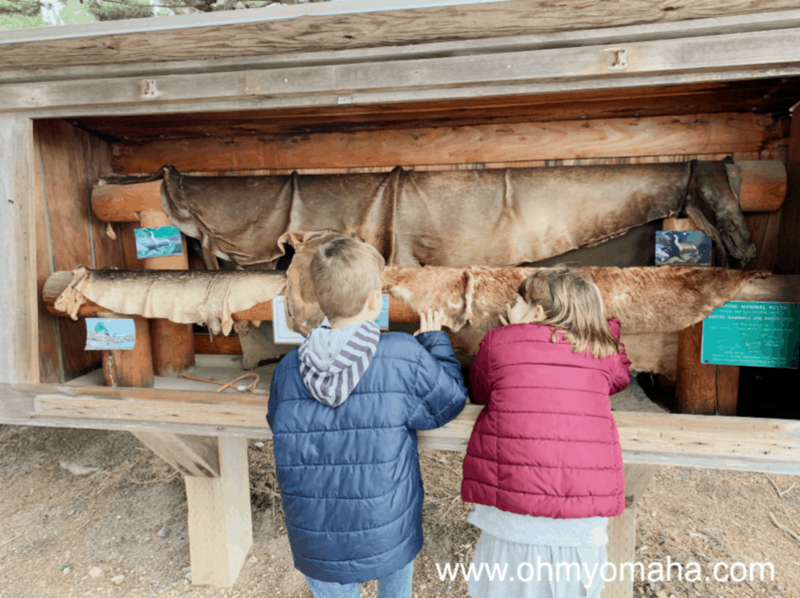 My kids liked touching the animal pelts on display at Point Lobos. My daughter may have been snuggling the otter fur. The volunteers also answered a few of our questions, like, what was the orange stuff covering the trees (answer: an algae called Trentepohlia aurea). 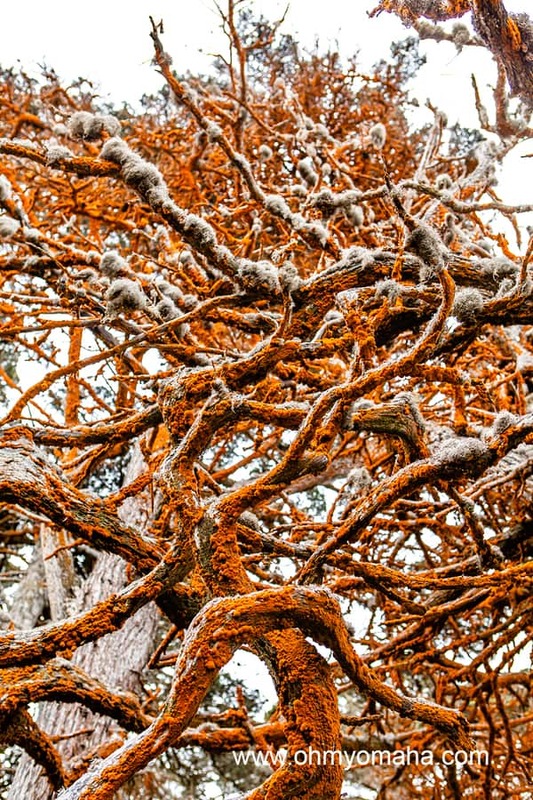 The algae growing on the trees at Point Lobos are harmless. There’s a Junior Rangers program for kids ages 7 to 12 that runs from Memorial Day to Labor Day Weekend. Get more details here. The park also provides educational information online, as well as Marine Protected coloring book you can download. 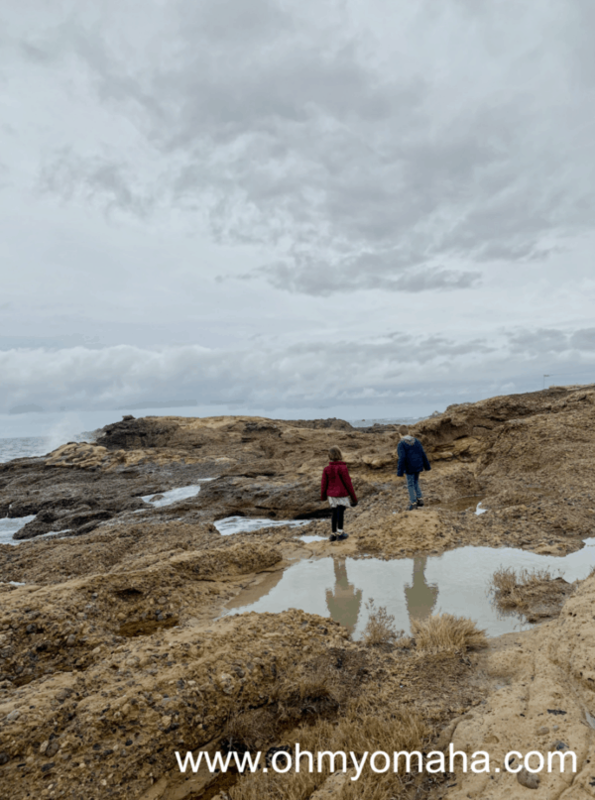 Would you want to visit Point Lobos on a rainy day? We visited Point Lobos in the winter. 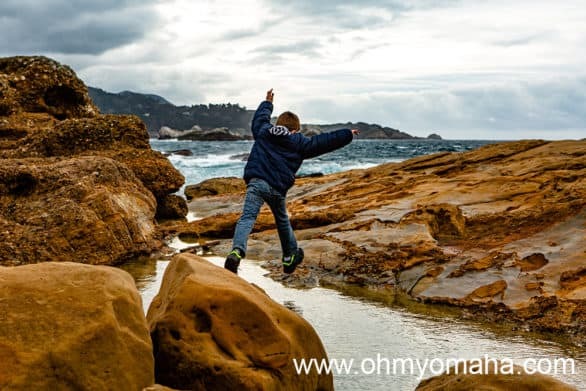 If you couldn’t tell from the pictures in this post, it was a dreary day when we went to Point Lobos State Park. All morning, the clouds threatened to spit rain. We ended up cutting our visit short because we knew a full-on shower was imminent. This is what you get when you have a first-year parkour student in your family. I wouldn’t recommend the tide pools in the wet weather, and hikes, well, they’re doable if you’re a hearty family. Check out the other things we did in the area when its as rainy, though, and you can find some good alternatives. I read that the climate at the park remains pretty moderate year-round, with temperatures in the mid-50s to mid-60s. You’re most likely to encounter fog in the summer. 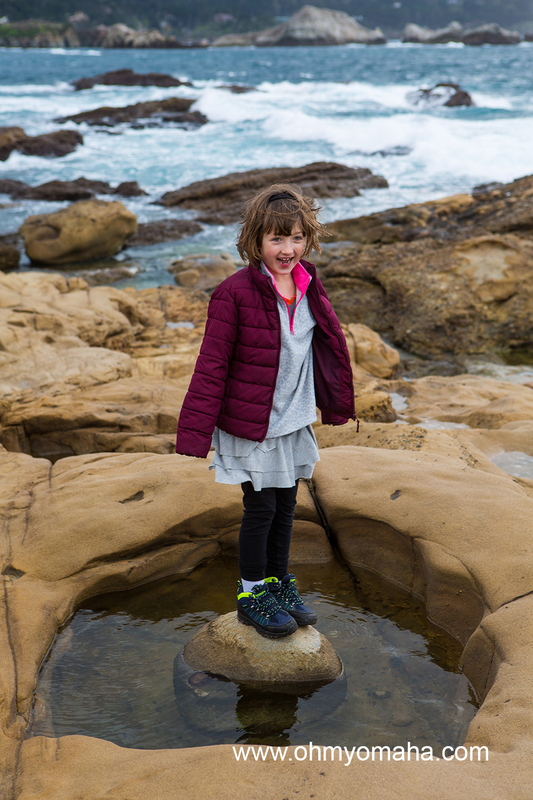 The kids liked exploring the tide pools at Point Lobos. 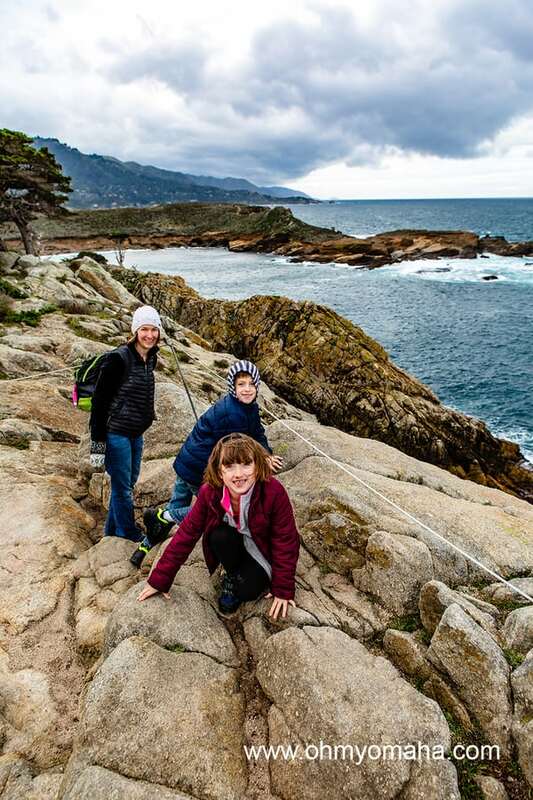 Point Lobos hours: The park is open daily from 8 a.m. to 7 p.m. They will not admit anybody after 6:30 p.m. There is no camping allowed. 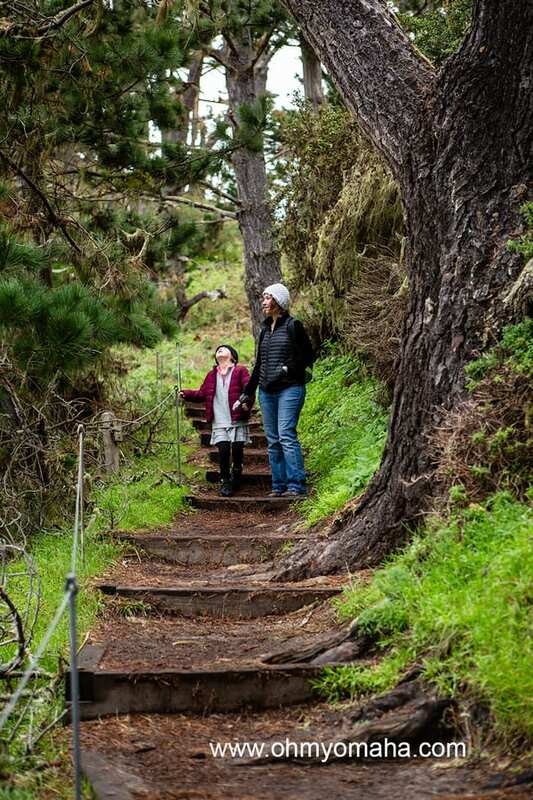 Point Lobos costs: You will need to pay a vehicle entry fee to enter the park. It’s $10 for most. If you want a brochure, it’s $2. If you want to dive or snorkel, there are additional fees (reservation or walkup). You can also also rent a kayak or standup paddle board for $10. 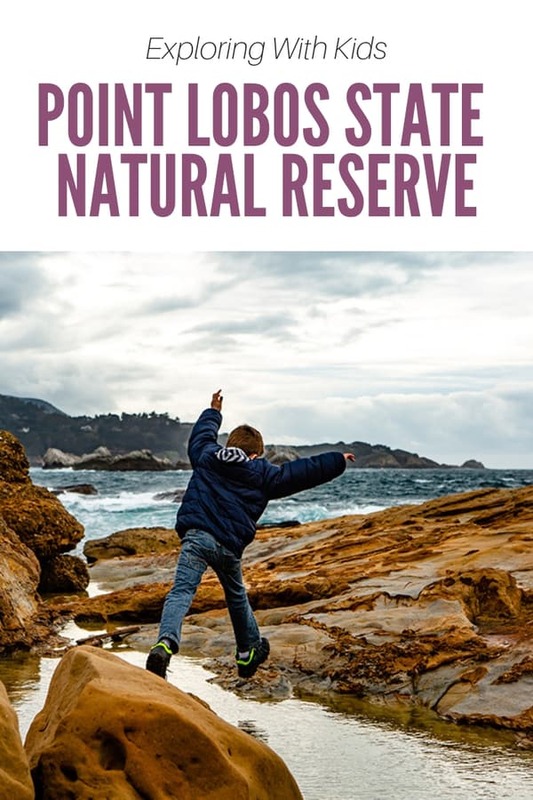 Point Lobos’ location: This California state park is pretty convenient for travelers since it is right off of Highway 1, plus it’s just about 3 miles from Carmel-by-the-Sea. 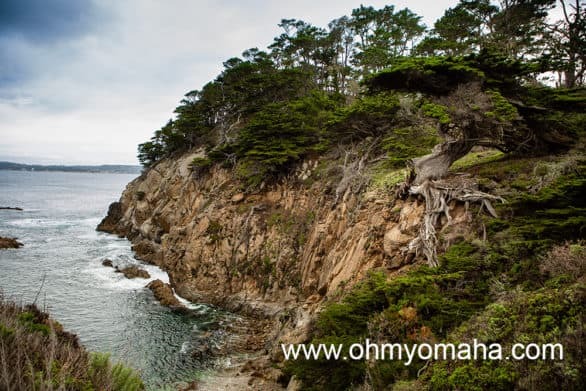 Carmel-by-the-Sea itself is a very attractive place for outdoor activities for families. There are beautiful parks, the beach, and strolling around the charming downtown area. When it’s rainy, though, you may want to venture to nearby towns for indoor activities. Touching kelp and other sea creatures in a touch tank at Monterey Bay Aquarium. While you could explore tidepools and possibly spot otters out in the wild while you’re in northern California, it’s not an enjoyable thing to do in the pouring rain. 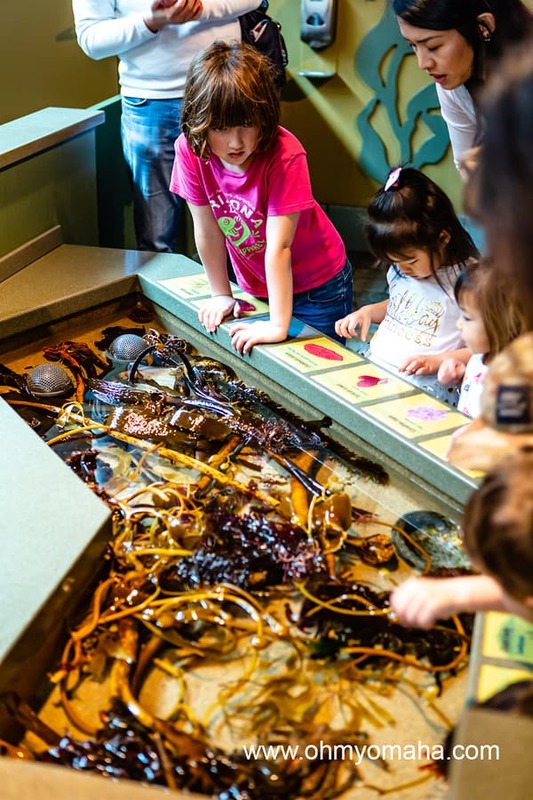 So, head indoors and find an abundance of aquatic creatures, hands-on exhibits, and play areas at the Monterey Bay Aquarium. There’s one play area that explores flight using sea birds, and head to the Splash Zone for play areas for toddlers and older children. Don’t skip the touch tanks. How much time there: Plan on at least 4 to 5 hours, but you could easily spend the whole day. 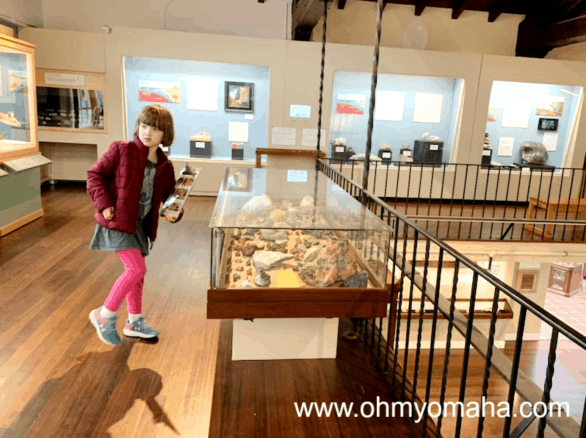 The Pacific Grove Museum of Natural History is a small but kid-friendly natural history museum full of displays of animals and artifacts from the region. Be sure to do the scavenger hunts – they’re a great way to explore all the exhibits, and the kids who complete one get a surprise at the end. How much time there: About an hour, depending on if you do the scavenger hunt or not. My youngest did all three scavenger hunts so we were there perhaps longer than most families would be. The Carmel Mission is an important historic site in California that tourists visit, but it’s still an active parish. Keep that in mind when timing your visit. The Basilica may be occupied for a wedding or mass. Most of the Carmel Mission and the museums connected to it are indoors (though the courtyard is the loveliest place to explore). It’s one of the state’s most important historical sites and it’s well-preserved. It was founded by Saint Junipero Serrai in the 18th century, and is the location of where he’s buried. As far as kid-approval levels go, this one was the least favorite of all our stops and part of your visit will be spent outdoors as you go from building to building. California is famous for great wine, so how could I resist planning at least one stop to try it? 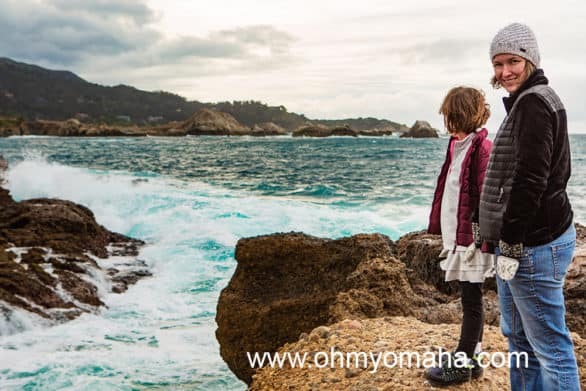 While researching Carmel-by-the-Sea, I checked out winery websites and travel blogs to find places that might welcome well-behaved kids. I had two on my list that were close to Carmel-by-the-Sea: Folktale Winery & Vineyards or Cowgirl Winery. Folktale Winery was in a building that looked like a castle, so I figured that would be a nice setting to step out of the rain for a moment. We didn’t make it to either, unfortunately. Where: Folktale Winery & Vineyards is in Carmel, Calif., and Cowgirl Winery is in Carmel Valley, Calif.
We nearly went to this art museum in Monterey because there was a day of family activities planned on the Saturday of our visit. It sounded fun and admission would’ve been FREE that day! Check the museum’s calendar to see if anything is planned during your visit. Typically, there is an admission fee for adults, but kids are FREE. You can see a sign for the Mirror Maze across the street from my car. I unwittingly took a picture of Highway 1 Golf, Games & Grub. We didn’t really go to it, I was just getting a picture of me in the Mitsubishi Outlander we drove while in California. Cannery Row is a touristy spot right next to the Monterey Bay Aquarium and on that street, you’ll find Highway 1 Golf, Games & Grub. I was considering a visit for my family (against my better judgement…because I really don’t enjoy putt putt golf). In addition to mini golf featuring murals of the Pacific Coast, the entertainment center has arcade games, and additional activities called Lazer Challenge and Mirror Maze. 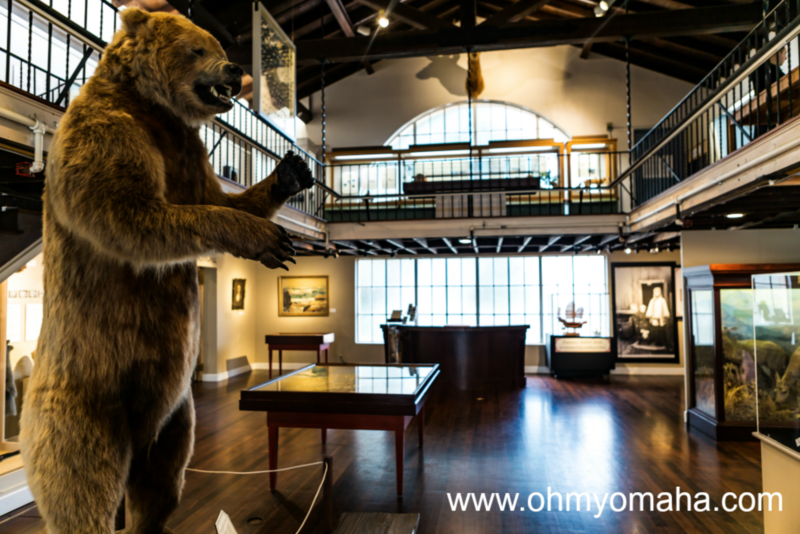 The Monterey Youth Museum, or MY Museum, is a children’s museum in Monterey. We love visiting children’s museums, especially since we can get discounted admission, but this one looked like it skewed a little more on the younger side than what would’ve been perfect for the kids. Still, I had it on the list, just in case. If you belong to a museum that’s a part of the Association of Children’s Museums (ACM), you may be able to get half-price admission here. 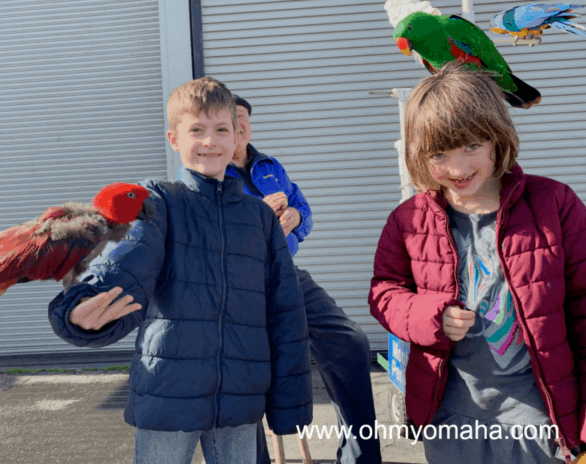 The Patron level membership for Omaha Children’s Museum qualifies! Find out about reciprocal membership benefits here. Should we pay to drive this road when surely every turn in Monterey County must be scenic? Is this something kids would like? Well, we did the trip to Carmel-by-the-Sea and we navigated (most of) 17-Mile Drive. So, let’s look into things how that worked out for our family, which included two kids under the age of 10. 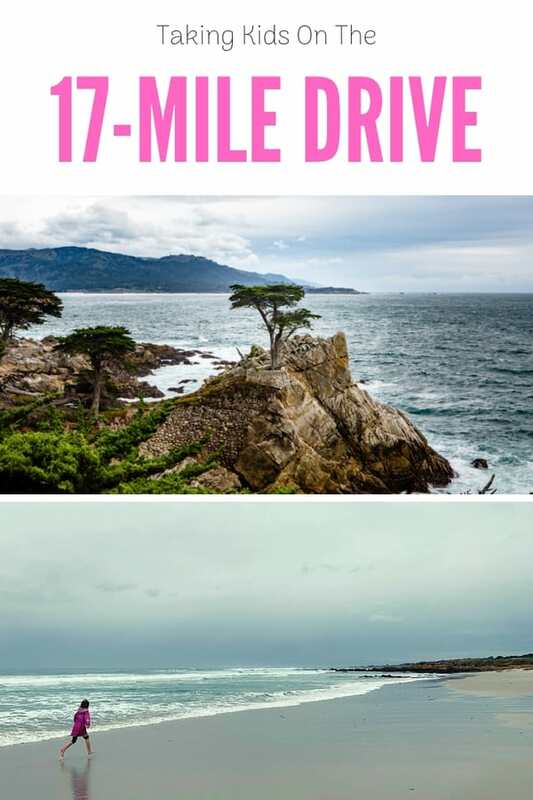 The 17-Mile Drive is exactly what it sounds like: A drive that’s 17 miles long. It also happens to be a beautiful drive, and so beautiful, tourists flock to drive it. Each year, more than 1.5 million people drive the route. There is a $10.25 fee to drive it, and there are various entrances along the route. If you spend at least $35 at any of the Pebble Beach restaurants, they’ll reimburse you. I was saving this drive for a sunny day on our trip. Rain was in the forecast every day of our trip, though, so I had all but decided not to do the drive. And then I changed my mind. It spit rain through most of the drive and it was cold, being winter and all. Once the rain picked up, we decided to cut the drive short. The view at Huckleberry Hill, one of the stops on the 17-Mile Drive. This was taken in early February, so thanks to rain, it’s pretty green there. 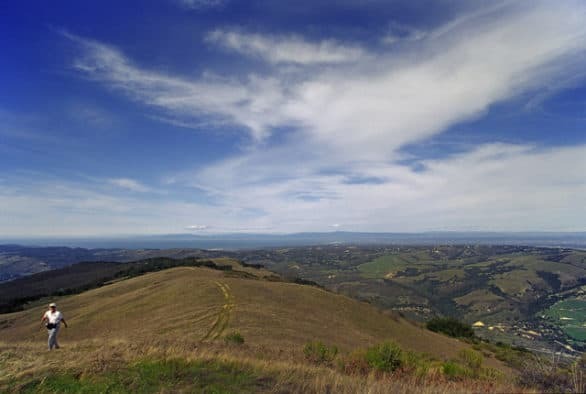 The story behind Huckleberry Hill is that the writers writers Robert Louis Stevenson and John Steinbeck were said to frequent it. So, late January/early February isn’t exactly ideal to go, but it was not very crowded, at least. What is there for kids to see and do? The good thing is that along with your entry fee, you’re given a guide with a map. They gave us two so our kids could follow along. You can download the app, too. There are 17 of stops on the route. Some how places for picnics or walking paths. 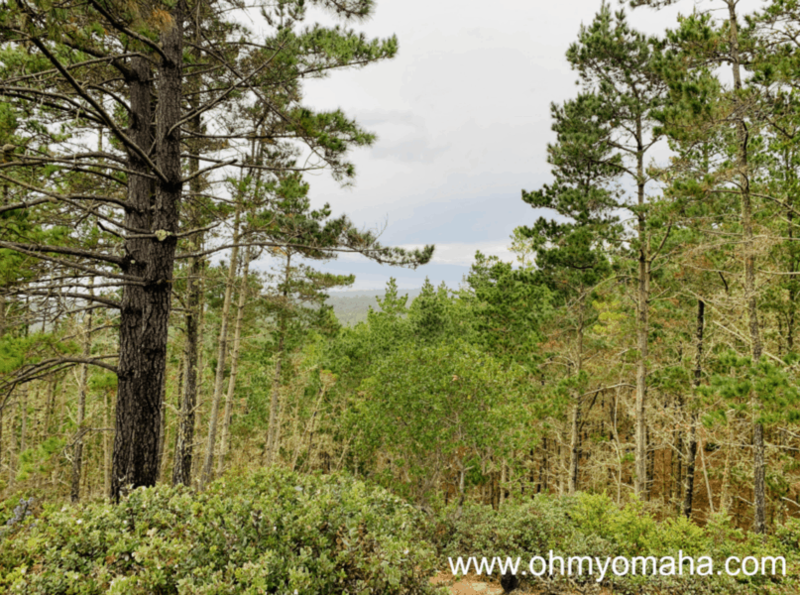 Our first stop on our 17-Mile Drive route was Huckleberry Hill. The kids found some interesting mushrooms, but other than that, the trail didn’t lead them too far. We started from the Highway 1 Gate and drove north first to start at No. 1 on the map. That meant we could drive counter-clockwise and have our car be on the lane closest to the water. Being the water babies that they are, my kids’ favorite stop was Spanish Bay Beach. They played in the cold waves, looked for rocks and shells, and chased after birds. The sand is soft there (and wet, because, remember, it was spitting rain). The large boulders by the parking lot invited lots of people to stack them. There were surfers to watch, and plenty of waterfowl. 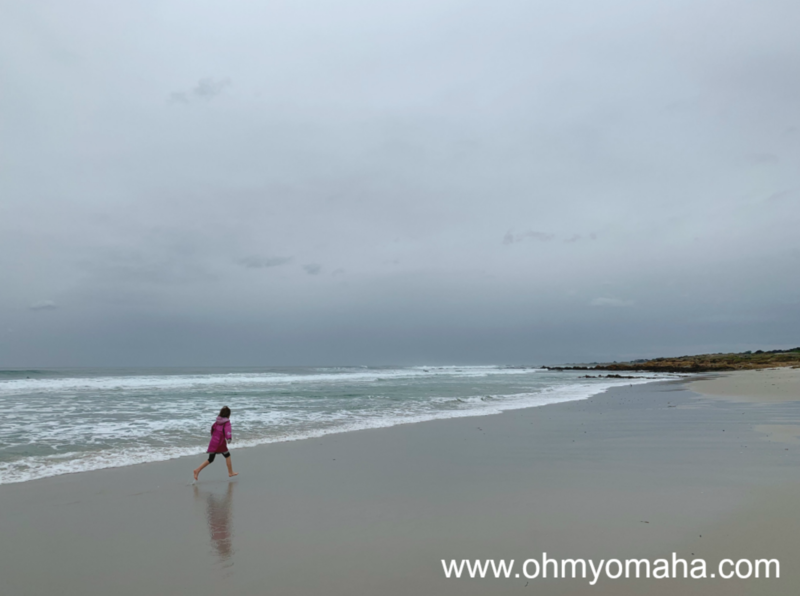 My daughter loves the water, even in the winter, so she enjoyed our rainy stop along the 17-Mile Drive at Spanish Bay Beach. 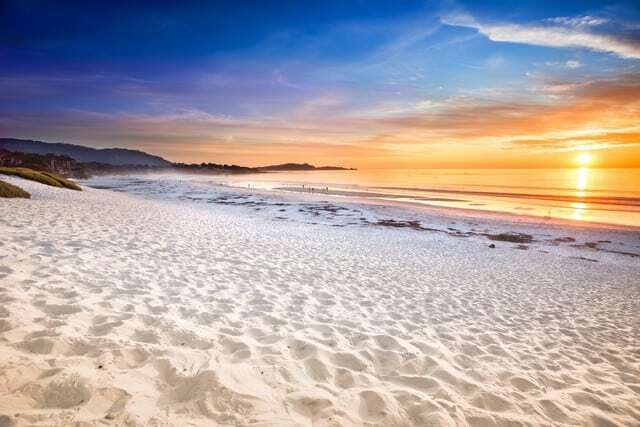 The beach got its name from the Spanish explorers who stayed at the beach in 1769 while trying to find Monterey Bay. It took them a year to find the right bay. Incidentally, Spanish Bay is the home to a daily Scottish bagpipe performance. The bagpiper plays rain or shine starting at the first tee at The Links at Spanish Bay in front of STICKS, and finishes 45 minutes later at the Spanish Bay fire pits by the second green. During Daylight Saving Time, this performance starts at around 5:45 p.m; otherwise it starts a half hour before sunset. 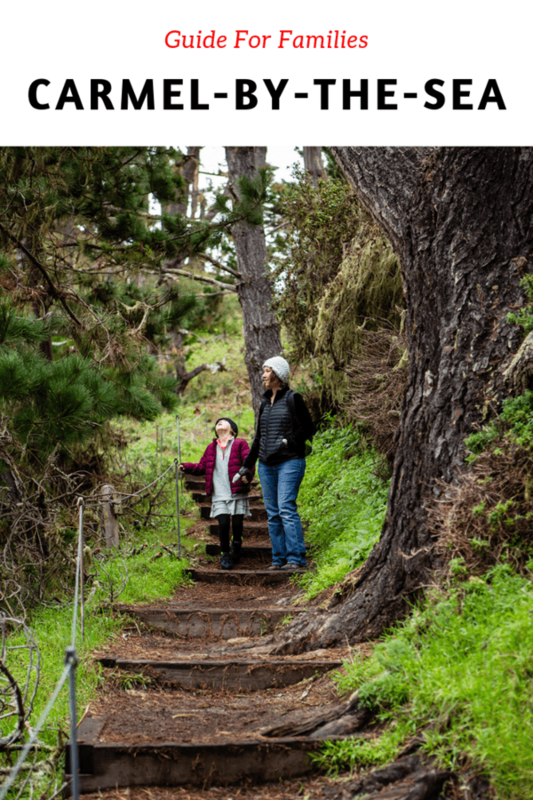 While at Seal Rock Creek, you can explore tide pools and take a walk the boardwalk to the interesting looking, and aptly named, Gingerbread House. By the time we made it to the Lone Cypress (Stop 12), the kids were bored. They didn’t even get out of the car. From all that I’ve read, the Lone Cypress is the most iconic and most photographed place in the area (and only midpoint in our journey). There were definitely more people at this stop than any other. We found the biggest crowd of all the stops at the Lone Cypress. It’s an iconic spot in California, which means a lot of selfies to be taken. The Lone Cypress is believed to be at least 250 years old. It’s one of the most photographed trees in the world. Would I drive this whole route just to see it? No. Is it worth paying to drive it? Well, sure. It’s beautiful. You’ll pass eight golf courses during your drive, including the storied Pebble Beach Golf Links. You might also see some animals. And the Lone Cypress is kinda cool to see. All in all, it’s nice. But truthfully, don’t go on a rainy day. It doesn’t have to be warm, but the rain is a drag. If you’re wanting to take pictures and walk around, it’s just not going to be enjoyable in the rain. And if you’re not into paying for something “nice,” then skip it and just drive around the rest of Monterey County. The whole region is gorgeous. Yes. There is a bike lane. I wouldn’t bike it with my kids, as it is narrow, or at least, looks narrow. I’d bike it if it were just me and my husband. If you bike, you don’t have to pay the entry fee. But you have to bike 17 miles. And it can be a little hilly in some areas. 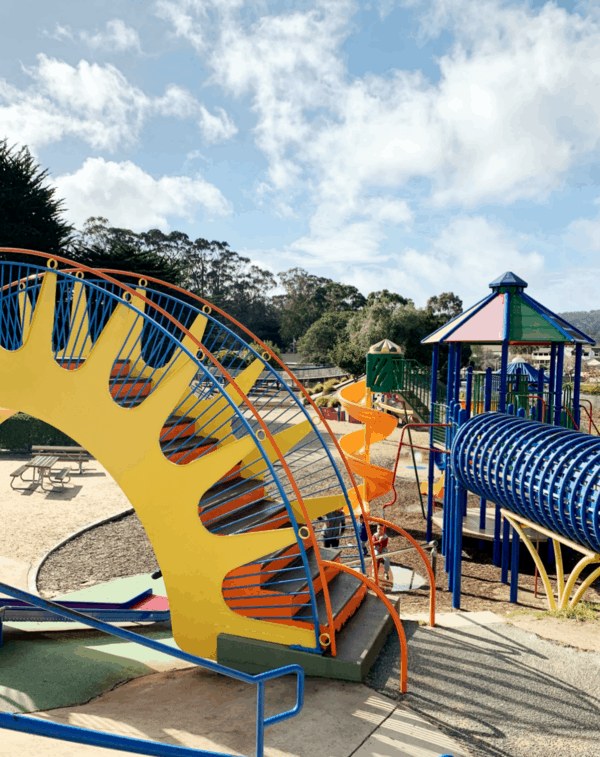 What about dining with kids on the 17-Mile Drive? There are a few picnic areas in pretty scenic spots, which is what I’d recommend. The hotels have several dining options but I couldn’t ascertain if any were kid-friendly or not. Online menus were no help – none listed kid’s meals, at least. Here are some family-friendly restaurants that are nearby, located either in Monterey or Carmel-By-The-Sea. Dreaming of a California getaway away from a big city? How about a storybook of a town by a beach? 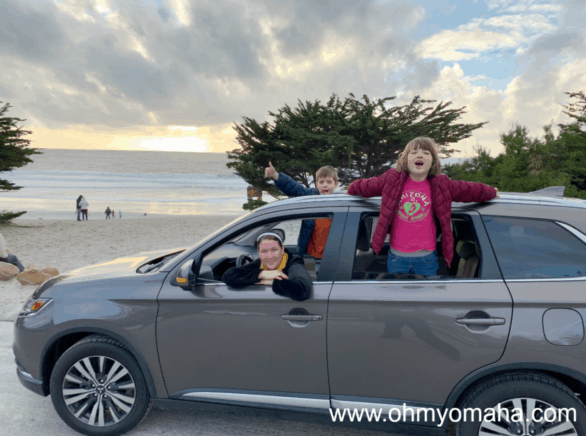 My family took a winter getaway to Carmel-by-the-Sea (Carmel for short) – you’ll have to read about all the things we did! 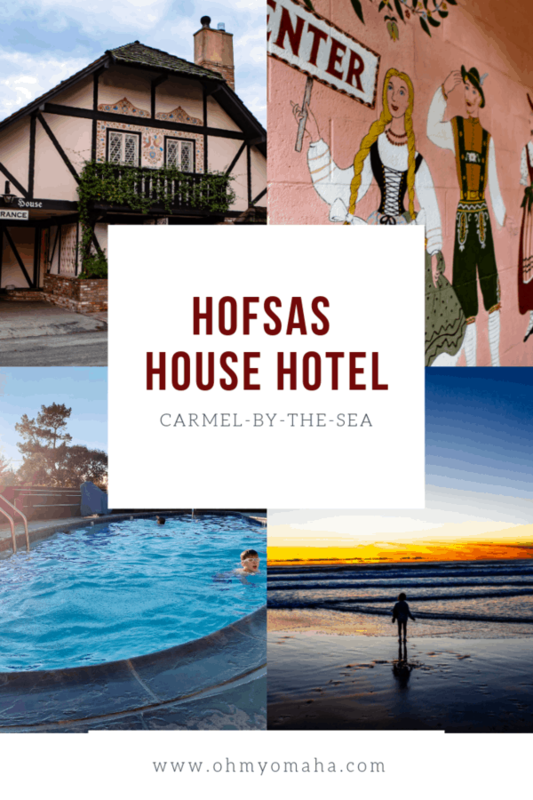 This post is about where we stayed in Carmel-by-the-Sea: The Hofsas House Hotel. Disclosure: Our stay was hosted by Hofsas House Hotel. Some of our expenses were comped and some were not. This Bavarian themed inn is one of the oldest in Carmel. What started as a few cottages in the 1940s, expanded in the 1950s to an additional 25 rooms and a pool. The hotel has been a family-run hotel since the beginning. 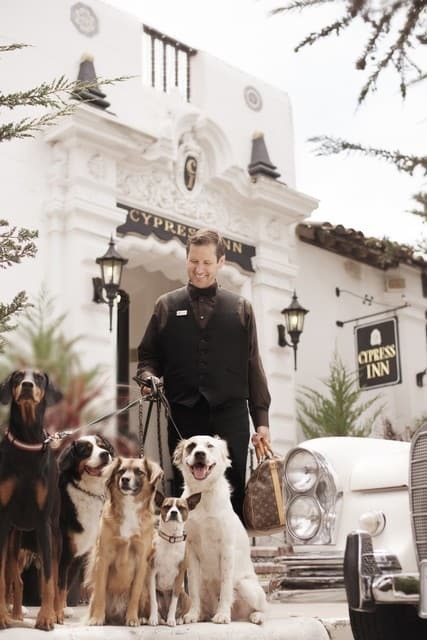 If you visit now, you’ll likely to meet Carrie Theis, granddaughter of the hotel’s founder. The Hofsas House, with its distinct Bavarian style, is one of the oldest inns in Carmel-by-the-Sea, Calif.
No two rooms are decorated alike (as Carrie told me, “We like color.). Some are suites, and great for families. Our suite had a private balcony with a sliver of a view of the ocean and fireplace (request room 40 if that sounds good to you). A wine and cheese package at the Hofsas House Hotel. 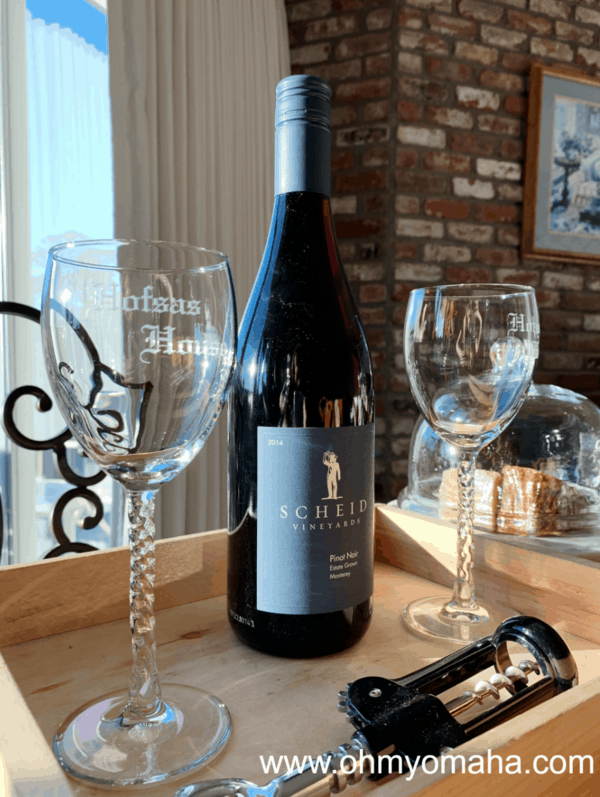 The wine was from Scheid Vineyard, not too far from Carmel-by-the-Sea. The hotel offers some packages that can get you golfing or relaxing in a spa, as well as in-room packages like wine and cheese pairing (which I believe I had in our room upon our arrival thanks to our gracious host). You can bet I enjoyed a glass out on our balcony that first night! There aren’t many hotels in Carmel with pools, so right away, this one is put above others. It’s a heated pool, so you can swim most any time of the year. Which my kids did. We arrived at the end of January and they went to the pool straight away. The pool at Hofsas House Hotel is heated, so you can swim in it year-round. And in case you were wonder, it was a balmy 60-ish degrees there. If you’re expecting Southern California winters, you would be mistaken. There’s also a dry sauna at the hotel. I guess that one’s more for us parents. If your child is actually a fur-baby, you’ll be happy to know they are welcomed. The mural by artist Maxine Albro is one of the first things you see when you arrive at Hofsas House Hotel in Carmel-by-the-Sea. The artist painted three pictures in the lobby, and the headboard found in the hotel’s Room 47. Let’s be real: The suites are made for families like mine. The hotel has several two-bedroom suites providing ample space for a family to spread out and relax. The kids could watch one TV in their sleeping area, while we could go to our room and watch too. Our suite included two rooms and two bathrooms. This space here included two day beds, which were great for the kids; a fireplace; and a small kitchenette you can’t see pictured. The second room in the suite had a king-size bed and one of the bathrooms. Our suite had a small kitchenette, two bathrooms, a separate room with a king-size bed, and a private balcony. Nice, right? Regrettably, we had terrible weather, so we could only sit on the balcony one evening. You could see a patch of the ocean from our balcony. Here’s the view from our Room 40 balcony at Hofsas House. Off in the distance, you can see the Pacific Ocean. There is a fridge in the room, making it convenient to bring some of your own food (if budgeting is important). 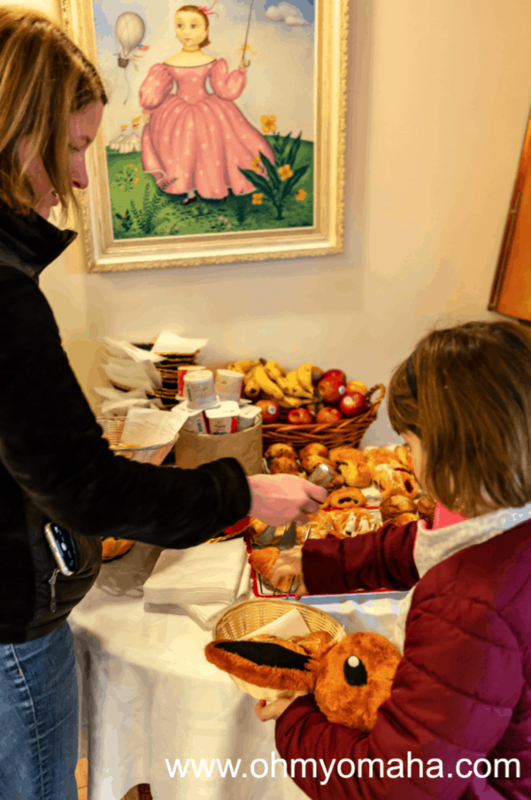 Hofsas House serves a complimentary breakfast each morning with fresh pastries, fruit, and yogurt. You can dine by the fireplace in the little lobby or take it back to your room (or balcony, right?). I’ve got a big appetite at breakfast, so it was not a substantial by my standards (I mean, I ate the Triple D breakfast at From Scratch). The hotel also offers free, off-the-street parking. We lucked out and had a covered spot, which was great since it rained a lot while we were there. 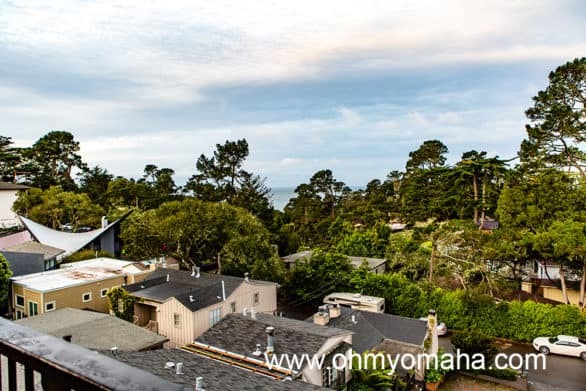 Hofsas House is within walking distance to all of the cute shops and galleries in Carmel-by-the-Sea, as well as restaurants. You’ll want to just walk around one afternoon while you’re there to take it all in. A block of shops in cottage-like buildings near the hotel. Most streets near the Hofsas House Hotel were lined with charming buildings like this and a lot of trees. To give you a sample of things that are just one block away, there’s a Dr. Seuss art gallery, the restaurant Hog’s Breath Inn, and a book store called The Pilgrim’s Way Books & Gifts (which is right next to the most enchanting-looking walkway leading to the Secret Garden). A courtyard garden we found just walking around Carmel-by-the-Sea. And a dozen more clothing shops and galleries and restaurants in that same block. A little further, like three or four blocks away, you’ll more kid-friendly things places to visit. Some of the ones that appealed to my kids included Thinker Toys, a toy shop, and the Cottage of Sweets, which is exactly what it sounds like. If this isn’t the cutest candy shop, I don’t know what is. This is the Cottage of Candy on Ocean Avenue, between Lincoln and Monte Verde streets. Carmel Beach is about an 8-block walk. The owner of the hotel warned us about the “healthy hill” on the way back. It is indeed quite the hill to trek back up! Keep that in mind if you have young ones. 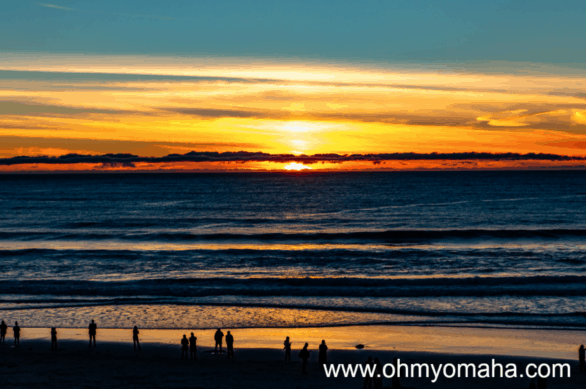 If the sunset promises to be beautiful, you’ll find quite a few people waiting at the Carmel Beach to witness it. The beach, and this view, is within walking distance from Hofsas House Hotel. If you’ve got a car, there’s a whole lot more within a few minute’s drive. 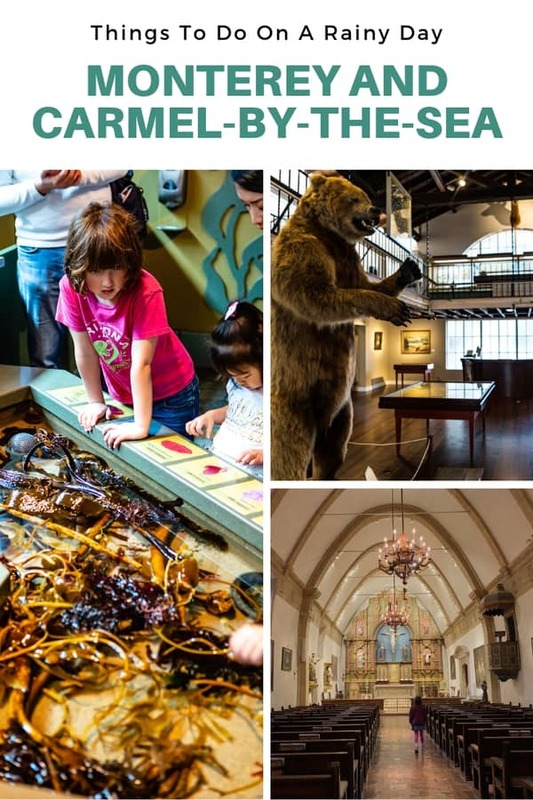 Skip down to the “Plan your Carmel trip” section to read about a few of them. 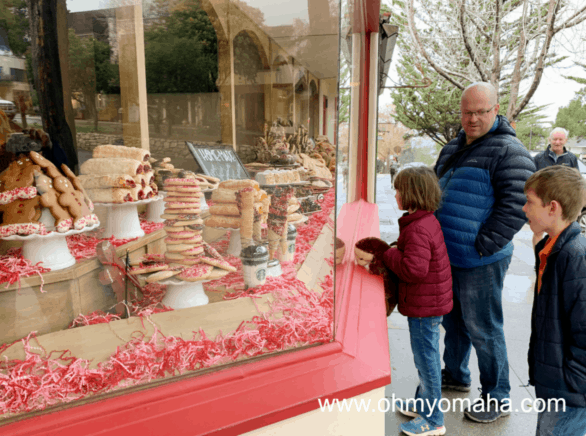 There was something about the window display at Carmel Coffee House & Roasting Co. that caught the attention of my kids on one of our walks. 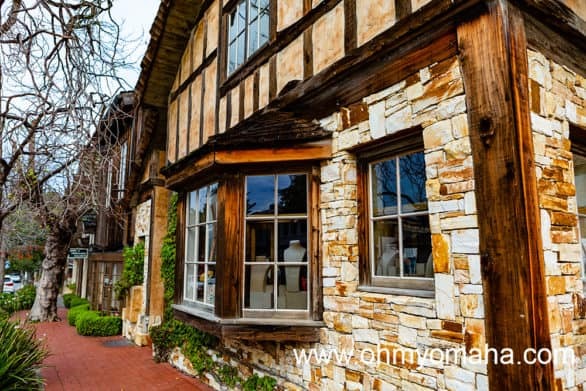 Carmel-by-the-Sea is a picturesque seaside coastal town in California, known for its charming architecture that looks like the setting for Hansel and Gretel. You can find countless suggestions for romantic restaurants and inns for a couple’s getaway, sure. But what about families? 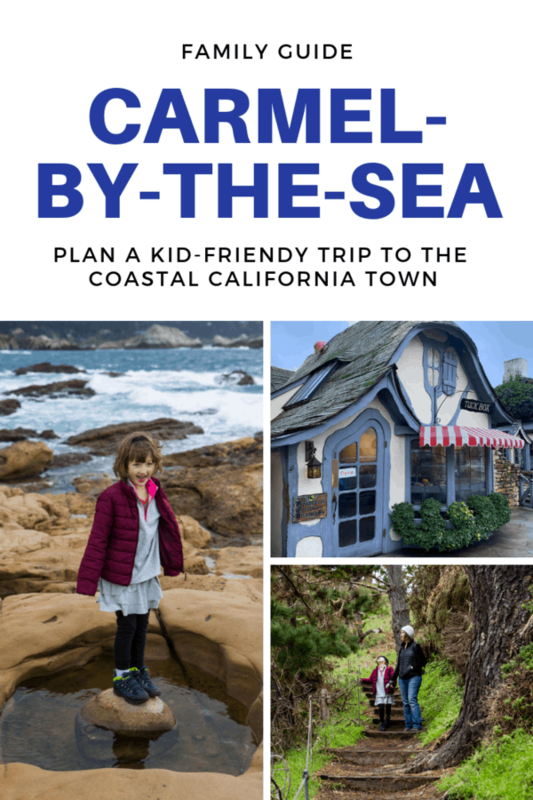 Can you plan a great trip to Carmel-by-the-Sea with kids? 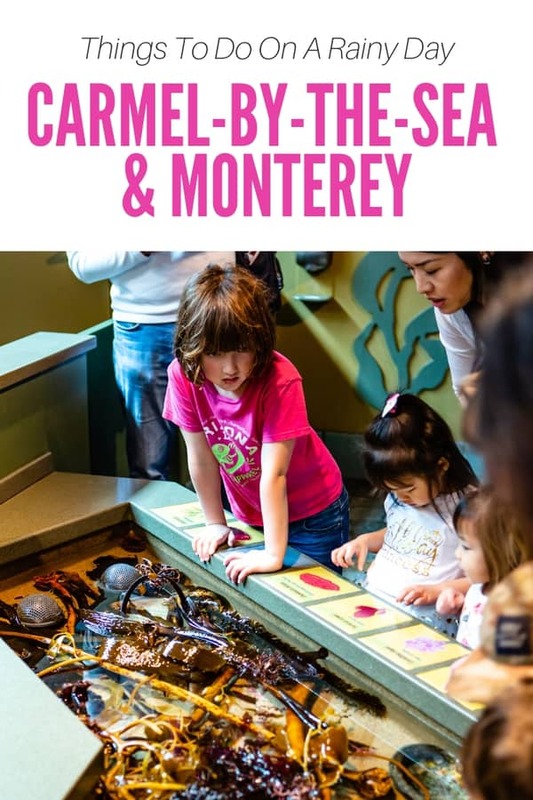 It turns out, there’s plenty to do in Carmel with kids, especially if yours is an outdoorsy family. Here’s what we did and how you can plan your own getaway! Disclosure: Our stay was hosted by Hofsas House Hotel. Some of our expenses were comped and some were not. This post may contain affiliate links. At no additional cost to you, if you make a purchase from an affiliate link, I receive a referral payment. 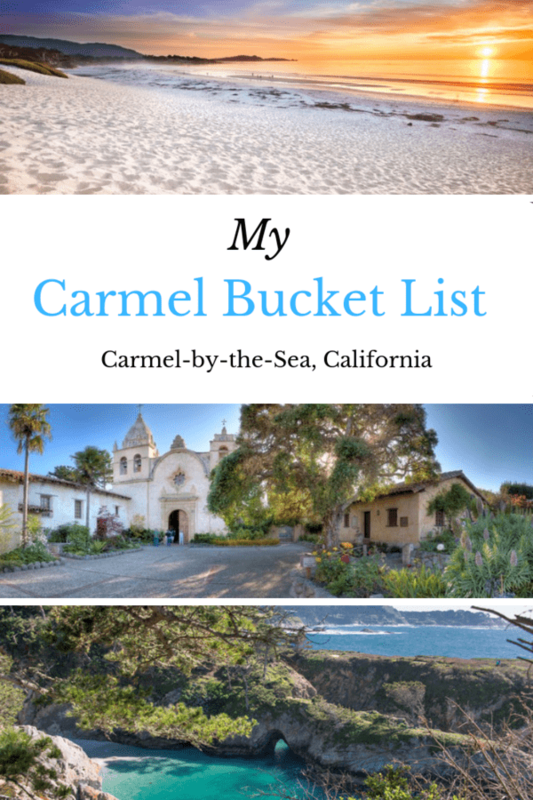 Note: Everyone refers to Carmel-by-the-Sea as Carmel, so I’ll be using it interchangeably in this post. Carmel-by-the-Sea is along the coast of California found just off the famous Highway 1, making it a perfect pit stop for road trippers. If you’re flying into the area, there is an airport in nearby Monterey. I found more affordable flight options into San Francisco and San Jose. Ultimately, we flew into San Jose and drove the scenic route south. 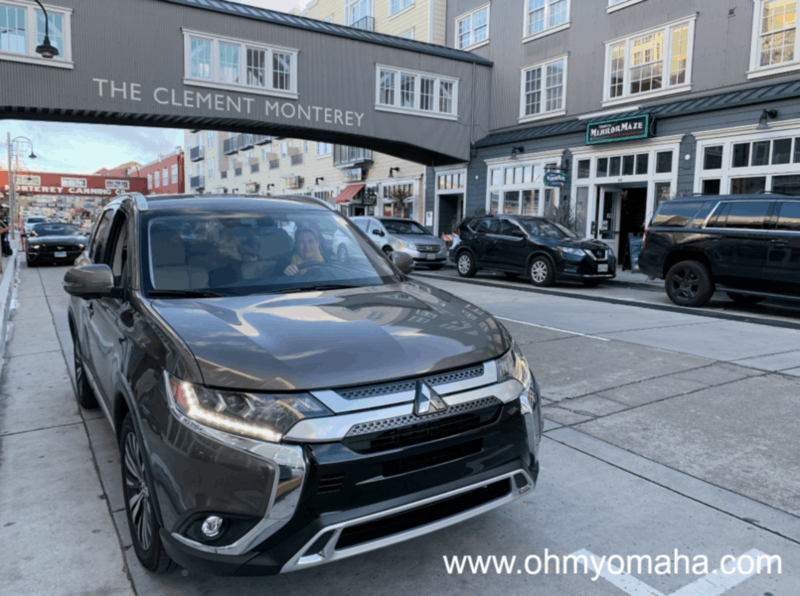 Here we are at Carmel Beach in the fab 2019 Mitsubishi Outlander we had for the weekend. 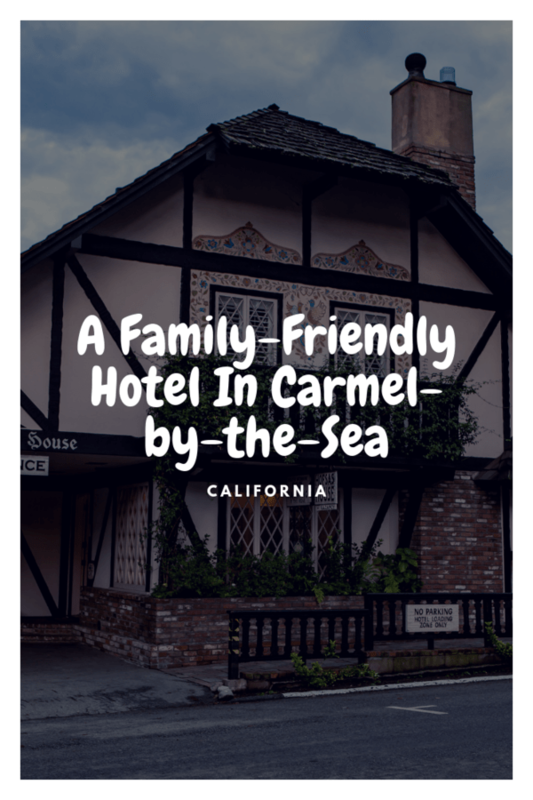 Carmel-by-the-Sea is a walkable small city, so I recommend finding a hotel or B&B near the city center. Since we had the kids, we wanted one with a pool (that was heated). We were hosted by Hofsas House Hotel, a charming Bavarian-inspired inn. 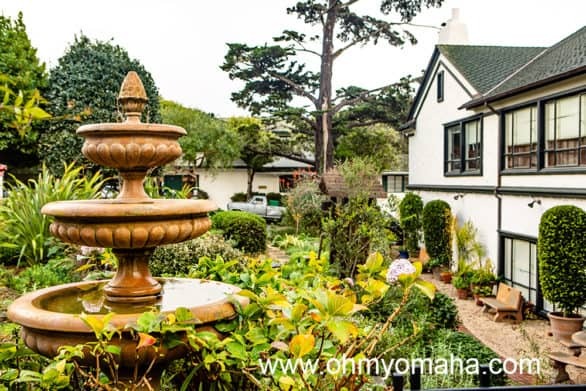 Hofsas House Hotel is a family-friendly, family-owned hotel in Carmel-by-the-Sea. It has suites that are ideal for families. Ours even had a private balcony. Each room has Dutch doors, which entertained my kids for a good 10 minutes once they discovered they could open just the top portion of our door. Find hotel suggestions at the end of this post! Carmel is a shopper’s paradise, but I quickly found that beyond the cute toy store and candy shops, my kids had very little interest in browsing. My kids peeking inside the Cottage of Sweets, a cute little candy store in Carmel-by-the-Sea. We passed by it on one of our early morning walks when the store hadn’t opened yet. 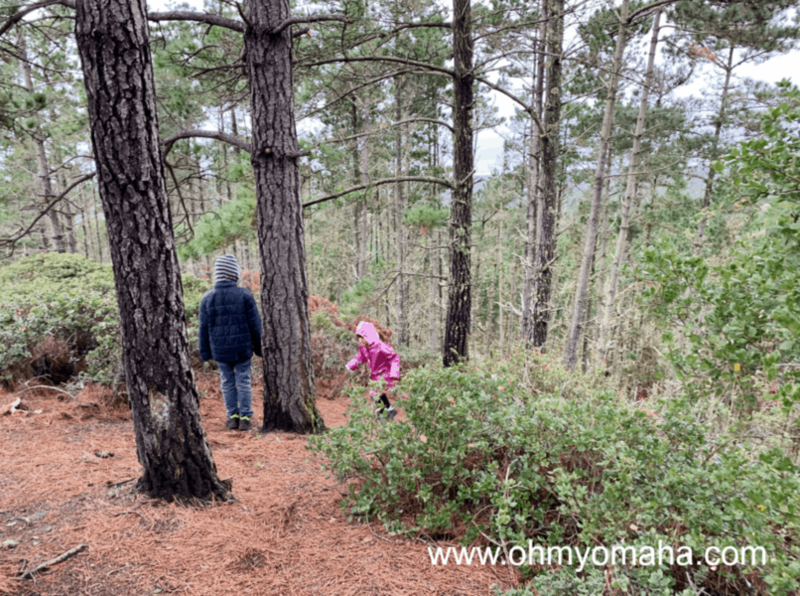 So, if you imagine your kids are similar, I have two outdoorsy recommendations for you. You’d better check out Carmel Beach. Think white, fine sand and plenty of space to run. It’s a dog-friendly beach, so if you have furbabies with you, they can run off the leash. We visited in the winter, so it was way too cold to actually play in the water. But, that didn’t stop us from going at sunset a few nights while we were there. We just had to bundle up. And I was kidding. My kids tried to get in the water many times. 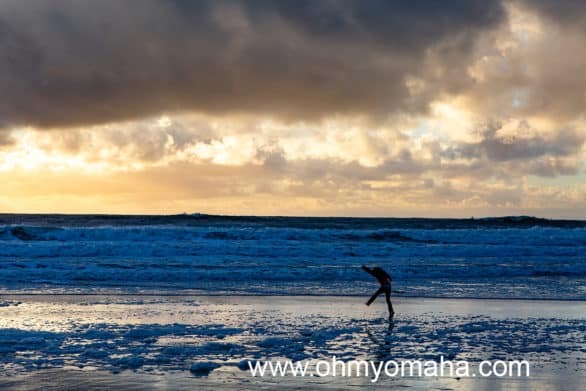 There’s my daughter, dancing in the ocean foam at Carmel Beach in the middle of winter. 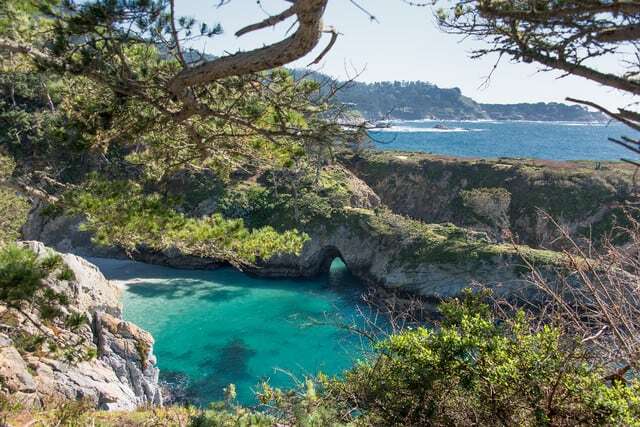 My other recommendation is to go to Point Lobos State Natural Reserve. For just the $10 entry fee, it was one of the highlights of our trip. It’s worth a visit. First, we hiked the easy Cypress Grove Trail. It took us to absolutely gorgeous views. On the hike to see the Old Veteran, a cypress tree that practically hangs off a cliff at Point Lobos. We found Old Veteran, the tree hanging on a cliff.We also spied seals in the distance. After the hike, we visited with park volunteers, who helpfully had suggestions on where else in the park we should go. My kids loved the tide pools at Point Lobos State Natural Reserve in Carmel. The tide pools at Point Lobos were amazing, if a little nerve-wracking as a parent. You can get right up to the edge of the surf. The kids were an absolute heaven – climbing, jumping and exploring the nooks and crannies. 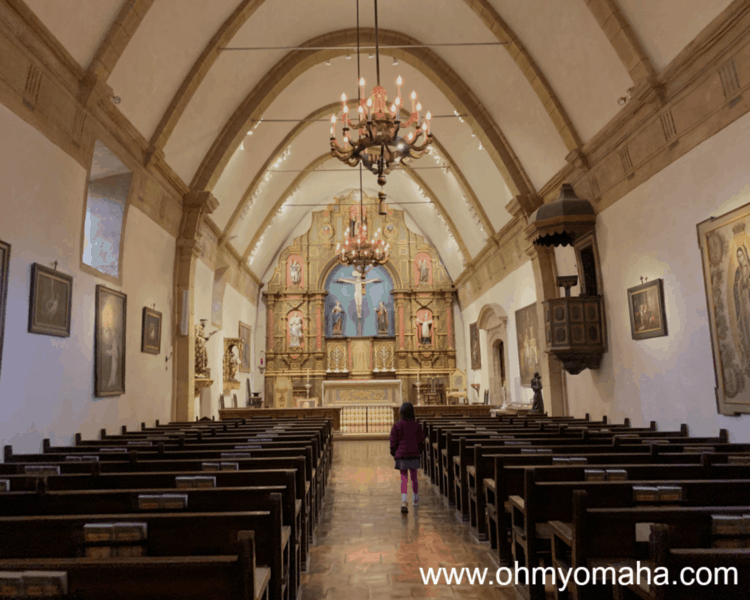 If you’re a history-loving family, or perhaps just devout Catholic, you may want to plan a stop to tour the Carmel Mission Basilica and the museums connected to it. It’ll take you about an hour, or less, and it’s one of the state’s most important historical sites. The courtyard at Carmel Mission Basilica is beautifully designed. Not pictured, just off to the right, is a fountain. 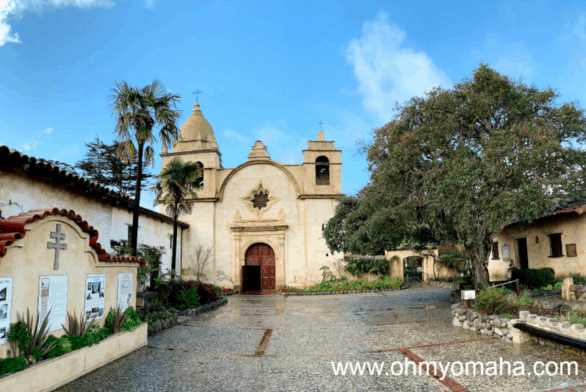 Carmel Mission Basilica has beautiful architecture from the 18th century and is a peaceful place to visit. It was founded by Saint Junipero Serra, and is the location of where he’s buried. But to be honest, the kids weren’t very interested in it (not even my history-loving son). I would’ve skipped it and saved the admission fee if I had known better. Monterey and Pacific Grove are two nearby towns you’ll want to check out if you are staying longer than a night or two. 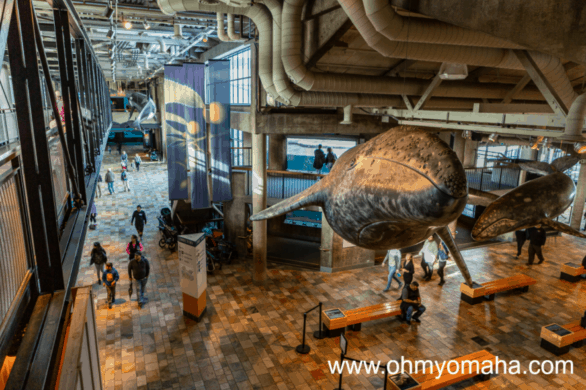 The biggie to see is the Monterey Bay Aquarium. The view from the second floor of the Monterey Bay Aquarium. The kids definitely enjoyed the experience, especially the touch tanks and sea otter feedings. There are quite a few hands-on opportunities as well as a play area (with a separate space for toddlers). There were all sorts of things in the touch tank at the Monterey Bay Aquarium. If you’re on a budget, this is one of the bigger expenses you’ll encounter on the trip. For the four of us, it would’ve been $160 if I hadn’t been given complimentary passes. Plan on spending a good part of a day there. I was told to expect to be there for about four hours, which is a good rule of thumb. We left for lunch and then returned for another hour or so. The aquarium is near Cannery Row, a super touristy street filled with souvenir shops and pricey restaurants. However, it’s worth noting that those pricey restaurants have outstanding views. Cannery Row has a few activities for families, beyond looking for wildlife in the ocean. There’s putt putt and a mirror maze, for one thing. 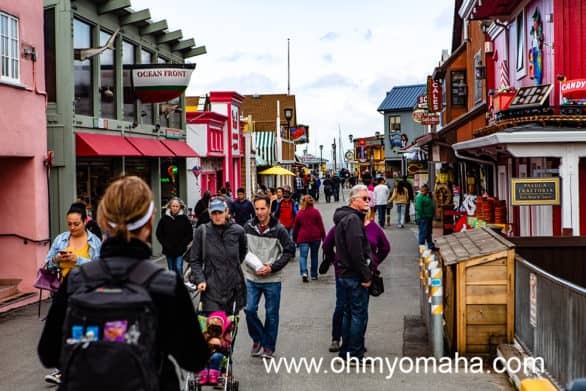 Even on a dreary and drizzling winter day, there were plenty of tourists strolling along Old Fisherman’s Wharf. Not too far away is Old Fisherman’s Wharf. Again, it’s touristy, but I liked it. The kids loved the candy stores, naturally. The wharf is where most whale watching tours depart. This is where we stopped to sample some of that free clam chowder everyone tells you about (my kids hated it). We also had lunch there. I talk about the restaurant, Abalonetti Bar and Grill, in the next section. We also found a guy with birds on the wharf. My daughter has an obsession with birds, so she spent quite a bit of time holding each one of them. Making friends with the birds at Old Fisherman’s Wharf in Monterey, Calif.
There’s a bike trail all along the coast in Monterey that would be a great route for families. It was rainy and cold during our visit, so we didn’t get to experience it. We had a brief patch of sunshine one day, so while we were in Monterey, we went to Dennis The Menace Playground. While it was funded by the cartoonist behind the character, there isn’t much that hints at Dennis the Menace besides some sculptures. Regardless, it’s a great playground. The Dennis the Menace Playground in Monterey had a ton of play structures, including a small climbing wall, which you can’t see in this picture, unfortunately. The Pacific Grove Museum of Natural History is a nice museum to visit when the weather isn’t cooperating. Be sure to do the scavenger hunts – they’re a great way to explore all the exhibits, and the kids who complete one get a surprise at the end. My youngest did all three, she enjoyed it so much. My daughter was determined to finish every scavenger hunt at the Pacific Coast Museum of Natural History. She completed three. You only need to complete one to collect a small prize. The museum has a small outdoor space with native plants to attract pollinators and migrating butterflies. Plus, there’s a large whale statue to climb in front. 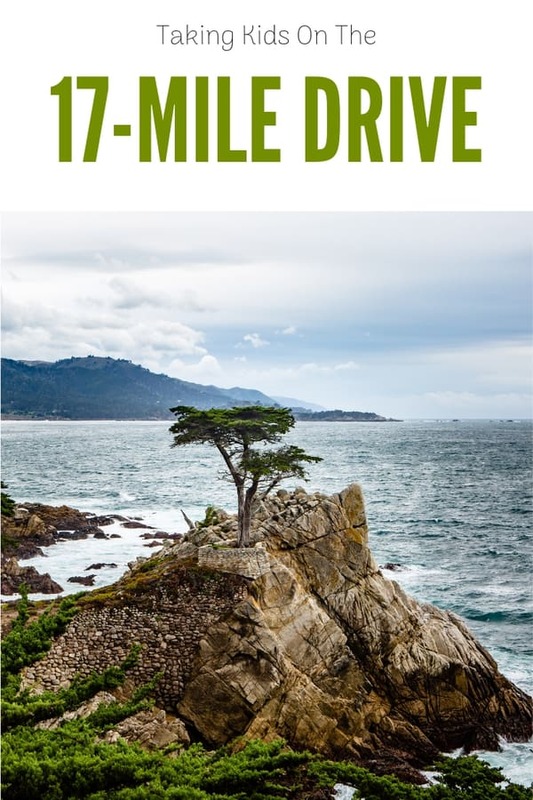 A lot of people told me about 17-Mile Drive. It’s the scenic route that takes you past Pebble Beach, by the lone Cypress and scenic overlooks. On a fairly rainy day, we paid our entrance fee and drove the route. We stopped at a few stops, including Spanish Bay Beach. The kids loved the beach. I was freezing cold. Maybe in better weather, I’d appreciate the drive more. I was pleasantly surprised how many restaurants had kid’s menus in Carmel. When I was researching the trip, I didn’t find many, so I was skeptical that it would actually be a good family-friendly destination. I’ll go into more details on the restaurants in an upcoming post. One thing I’ve got to get out of the way, as a Midwesterner: Whatever your budget is for dining, double it in Carmel. Breakfast was my favorite meal in Carmel. From Scratch (of “Diners, Drive-Ins & Dives” fame), was great, with a friendly staff and kid’s menu. There was a slight wait the morning we went. 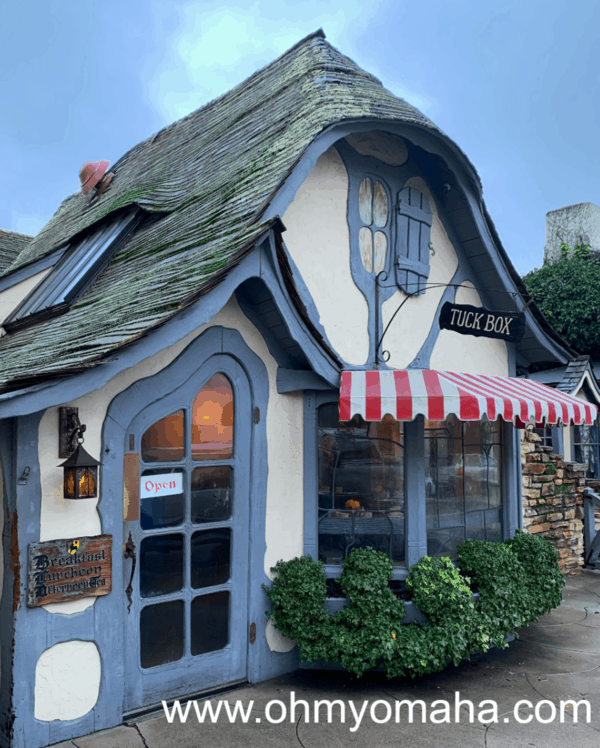 Appearing to be a structure straight out of Hansel and Gretel, Tuck Box is actually a restaurant in Carmel-by-the-Sea. Tuck Box was the most charming of all places we went to. While it didn’t have a kid’s menu, it did have pancakes, which was fine for my kids. We went early on Sunday morning, so there was no wait. Be sure to bring cash, as they do not accept credit cards. We didn’t get any breakfast at this next stop, but the coffee was great, so I’m recommending it. Carmel Belle is tucked away in a shopping center, and strikes me as a local version of Panera, but better. Be sure to get a table along the window at Lalla Lounge located in Cannery Row in Monterey, Calif.
Baja Grill: The décor is a lot of fun here. It’s all race cars, motorcycles and related movie memorabilia here. The food was OK, and the staff was friendly to the kids. 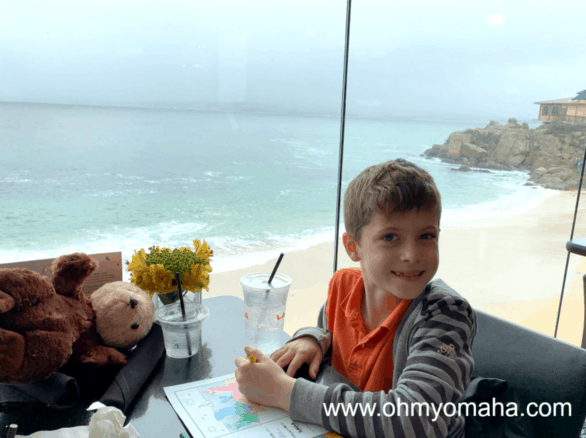 Lalla Lounge: This restaurant on Cannery Row in Monterey had the best view of the trip. The kid’s menu had a nice variety, and I enjoyed my salad. Abalonetti Bar and Grill: This Old Fisherman’s Wharf restaurant came recommended to us by the guy pouring the wine at a wine tasting room. (BTW, I heard it pronounced like “Apple and Eddie”) We all had fish and chips (or shrimp and chips) for lunch. It was fine. Don’t as you walk the wharf, you can sample several chowders for free. It’s almost a meal itself. Fifth Avenue Deli: We stopped here to get some picnic food one day. Unfortunately, the weather was definitely not picnic weather. La Bicicleta: This Carmel bistro came highly recommended to us. It’s super charming, and what I’d picture as an ideal date spot. There’s no kid’s menu, but there are pizzas on the menu, so you’re not totally out of luck if you bring kids with you. Still, this one I wouldn’t necessarily say is the best choice. Lugano’s Swiss Bistro: Fondue makes for a fun night out with the kids, don’t you think? This place is decked out like a Swiss chalet, and the menu is features German food in addition to the fondue. Ask for a kid’s menu, if you’re not going to want to pay adult prices for the kids. I had the schnitzel – it was superb. Sur Restaurant: Not to put down Sur, because the burger was great, but this was our second choice after our first choice had an hour and a half wait and the rest of Carmel was out of power. It’s in the same shopping center as From Scratch and Lugano’s. There is a kid’s menu there, at least. If you’re curious about wineries and wine tasting rooms (because there are several in town, and the wineries are nearby), I’m sorry to say we didn’t go to many. I had two in mind that I’d read were welcoming to families. I included them on my Carmel Bucket List. 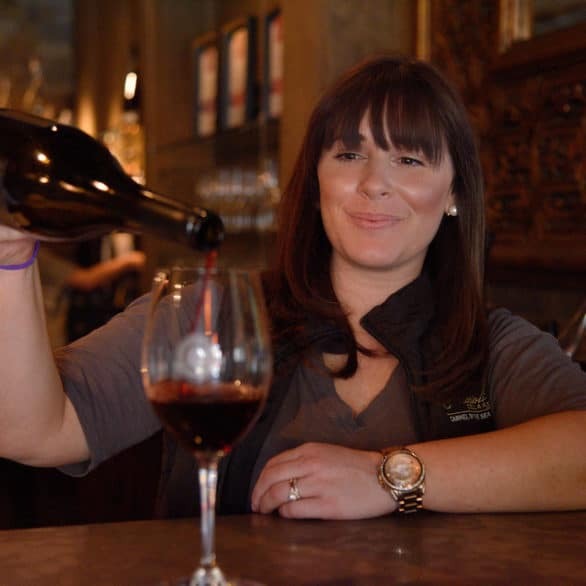 Carrie, the owner at Hofsas House, said most wine tasting rooms are kid-friendly as they’re not technically bars. We stopped at one called Dawn’s Dream in Carmel. There were couches in a corner with a stack of coloring books, so we felt fine letting the kids entertain themselves why we tried the Chardonnay and Pinor Noir. 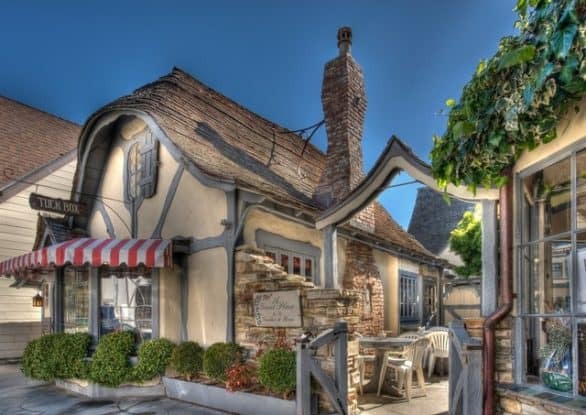 Carmel-by-the-Sea might have been a town pulled straight out of a storybook. I’m planning a family trip to Carmel, and while doing so I’ve been obsessing over images from the region for weeks. Carmel has been described in the New York Times as having “42 hidden courtyards and alleys shelter a plethora of stylish new galleries and boutiques,” and its precisely those courtyards, along with the unique architecture that make it a fairy tale setting in my mind. And I can’t wait to go there! Disclosure: I am working with a hotel, Hofsas House Hotel, which is located in Carmel-by-the-Sea, Calif. All thoughts, opinions and typos are my own. I’ve got plans to explore Carmel (and eat all the food), and that’s what this list is all about. 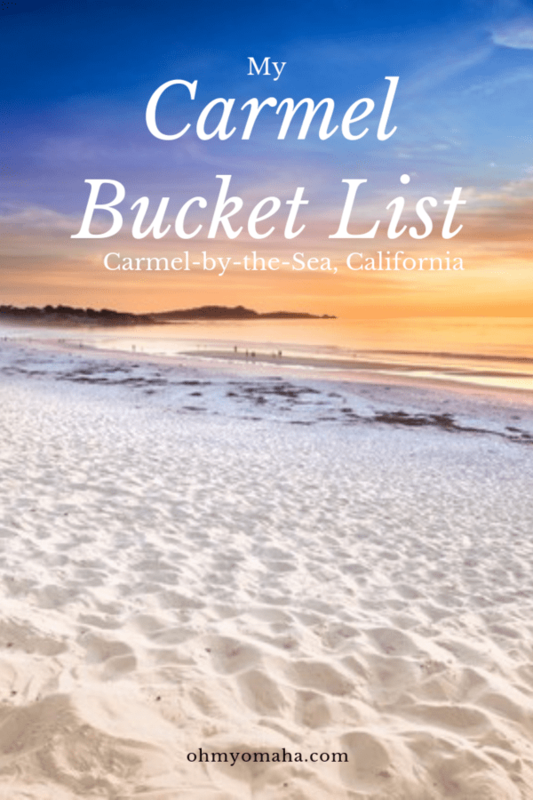 My bucket list for Carmel is the ultimate list of things I wish I could do there if time and money were not a factor. 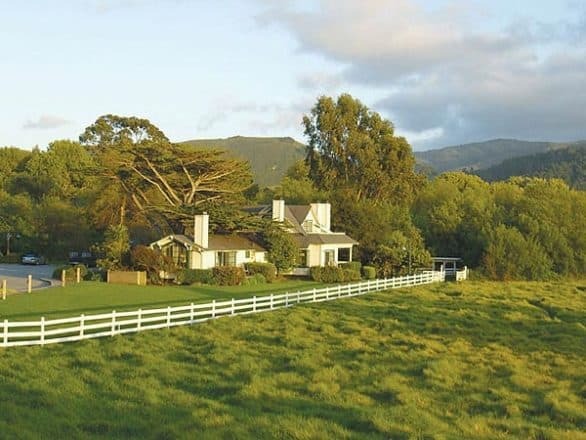 Clint Eastwood’s restaurant is more commonly known by its real name: Mission Ranch. I’ve heard the pastoral views are amazing. On Sundays, there’s live jazz music during brunch. It’s also one of the few restaurants I’ve come across in my research that had a kid’s menu! San Carlos Borroméo del Rio Carmelo Mission, commonly known as the Mission, is an important historical and religious site in Carmel-by-the-Sea. Founded in 1771 by St. Junípero Serra, the Mission was the headquarters of the Alta California missions and is where St. Junípero Serra is buried. I have a history-loving son, and I’m pretty sure we’re going to spend a lot of time at the Mission. Every travel writer and every photographer who writes about Carmel writes about and shares gorgeous photos of Point Lobos. 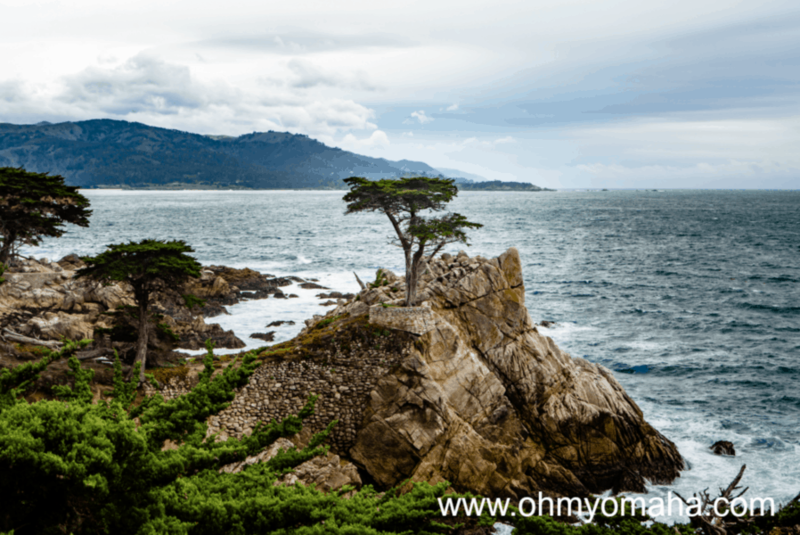 I love the idea of hiking through the Monterey cypress grove and seeing the waves crashing on the rocks. Supposedly, author Robert Louis Stevenson was inspired with the idea of “Treasure Island” while strolling the beach near Point Lobos. Head to Sea Lion Point, with binoculars, to see the sea lions sunbathing or perhaps further in the distance, whales. If I had the skill, I’d try scuba diving there. The water is protected within the Monterey Bay National Marine Sanctuary. There are two drives that pass through apparently stunning scenery. I’d love to do both. 17-Mile Drive winds from Pebble Beach Resort to Pacific Grove along the picturesque coastline. Things to see include the most iconic tree on the California coast (an old Cypress), sea lions on the beach, and Spanish Bay. This drive requires a $10.25 entry fee. The other scenic drive is Highway 1, or the famous Pacific Coast Highway. I’d love to make this drive for a day trip to Big Sur. I heard there are pretty beaches found along 17-Mile Drive. I’m well aware how cold the water can be, so I’m all for just admiring the view. But you know what sounds good? A bonfire on the beach. It’s allowed at Carmel beaches, and the hotel I plan on staying at has a bonfire package to purchase, complete with blankets and s’mores ingredients. Part of my trip planning for any vacation is to see what concerts and shows are occurring while I’m there. 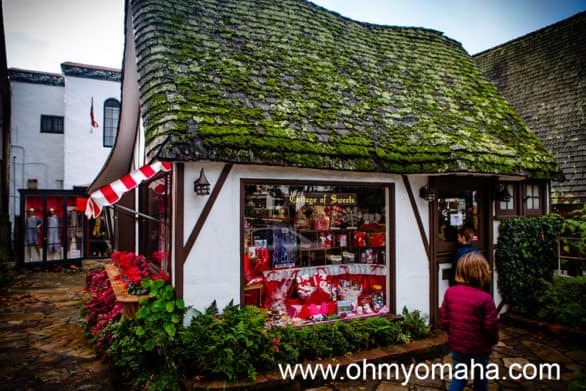 One place that caught my eye is the Golden Bough Playhouse in Carmel-by-the-Sea. It’s home to a year-round theatre, and as luck would have it, there’s a show the weekend we’re there (“Billy Elliott”). 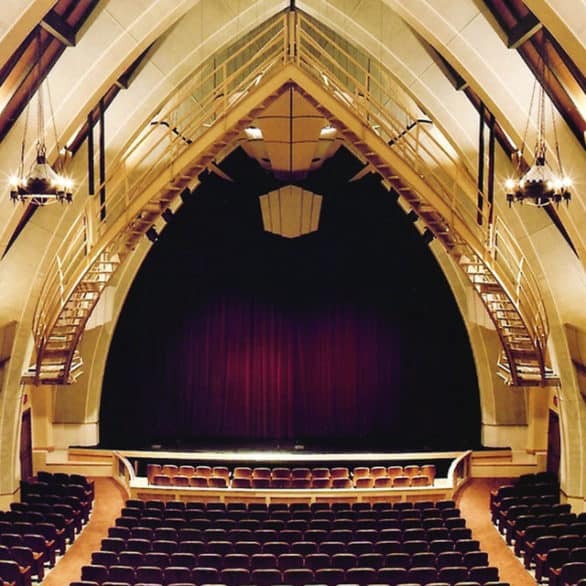 Another indoor option is the Sunset Center, which offers a variety of performances in a state-of-the-art setting. I’m missing out on a Willie Nelson performance and, in the spring, a “Friends” parody. There’s also Forest Theater, Carmel’s outdoor venue for plays, films and special events. It looks to be a pretty seasonal entertainment option, though, and my winter visits isn’t going to line up with any performances. I’m familiar with the organic brand, Earthbound Farm Organic, and have purchased so much spinach over the years from that brand. It all started in Carmel Valley. Down the road from the original farm, visitors can go to the Farm Stand. I’ve read that lunch at the Farm Stand is tasty and affordable, and you can’t beat the setting. I’ll have to look for the K ids’ Alphabet Garden. It’s California, after all, so I’ve got to try the local wine. I’m making it my goal to find one winery that caters to families (which is to say, let’s parents sample wine and still welcomes kids in tow). They’re out there, I know. While I’m dreaming on things, if I were to travel without the kids, I’d totally be trying out the Carmel Wine Walk-by-the-Sea. The choices for world-class dining are a little dazzling. I’d imagine dinner at any restaurant at Pebble Beach would include unforgettable views and probably a celebrating sighting or two (I heard The Bench had a good view of the 18th Hole). There’s also the Aubergine, where a wine pairing dinner sounds absolutely divine. 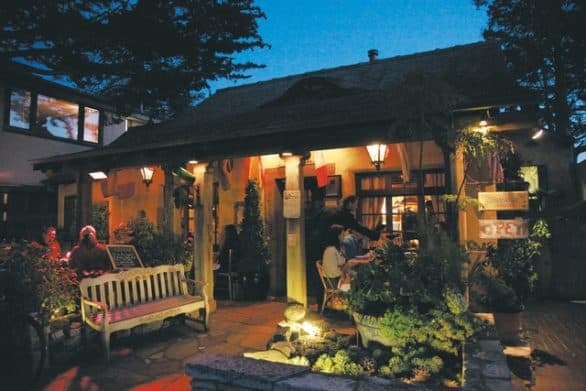 Or maybe I’d dine at Casanova, called “one of Carmel’s most romantic restaurants” by Zagat. Word is, that restaurant has a table from France that was one Vincent Van Gogh dined at. Yeah, I’m not a golfer, so golfing at Pebble Beach is not going to be on this list. But hearing the Scottish bagpipes played on the green? Sure, let’s do that! This is a daily occurrence in the evenings throughout the summer. What should I add to this bucket list? Where would should I eat? Where should I go?